Ageless Monche Mountains. Wild northern reindeers saved from die out! 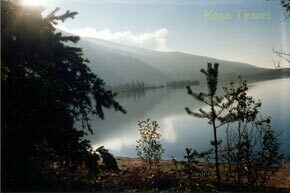 In the centre and on the west side of the biggest lake Imandra Lake of Kola Peninsula Russian Lapland you can find the Monche Mountains. 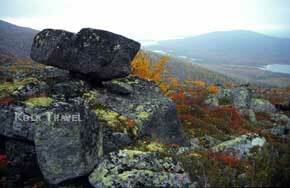 The first mountain ridge separates the civilization of Monchegorsk with the beautiful Monche Mountains area. The contrast between the west slope with the charms of living nature and the east slope, the zone of human’s activity, of these Monche Mountains ridge is striking. The huge valley or low-land area of the Vite River in the Monche Mountains consists of virgin pine forests and spruce forests which age is 400-500 years old. More to the northwest direction the valley become a ravine. The nature there is like Japan banzai gardens where mountain and forest landscape are shown in miniature. The beautiful waterfall Ebr-chorr (the waterfall of Rain Ridge) separates the low and high plateau of the ravine. 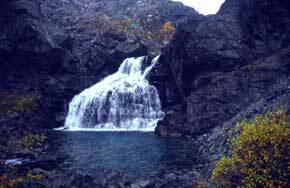 The stream from the waterfall Ebr-chorr is running between high vertical walls and is falling into a stone cup on the palms of Lapland. In the ravine Karneskorch (the Raven’s Ravine) where the river springs are nests of the rare Nordic bird, the 'gyrfalcon' having its territory in the fells. 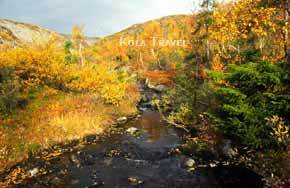 The downstream of the Vite River flows into saint lake Seidjavr and continues to flow to the Imandra Lake. 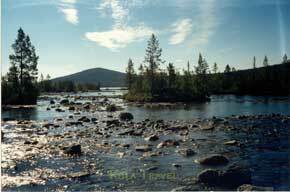 The Monche Mountains are part of the Lappish Reserve also known as the Lapland Reservation or Laplandski Natural Reservation in Russian Lapland, which is founded in 1930. 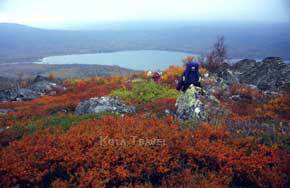 The Lapland Reservation is second by size in the European part of Russia and measure 2784 squared kilometres. This territory was allocated to reserve for realisation of the major purpose; preservation and restoration of a livestock of wild reindeers on the Kola Peninsula. As a result of active hunting, the wild northern deer in the west of the Kola Peninsula appeared on the verge of extinction to the moment of foundation of the Lapland Reservation. About hundred reindeers were still keeping their distance in the most remote district on the Chuna Tundra, everything that remained from herds of many thousands. Places of dwelling of the last herd of reindeers Chuna Tundra and Monche Mountains were included in the territory of reserve. 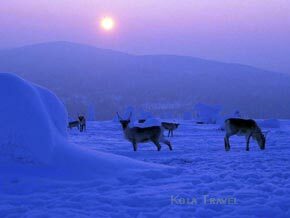 Already in 1967, as a result of creation of Lapland Reservation the number of reindeers in the western part of Kola Peninsula has reach 12.500. However the density of the ‘savages’ has proved to be uneasy, their number again has fallen down to 200 heads by 1980. The number of reindeers in the Monche Mountains is nowadays 2.000 and at the same time 430 species of plants, 15 species of fishes, 119 species of birds, plus 56 kinds on migration, and 28 species of mammals lives there.